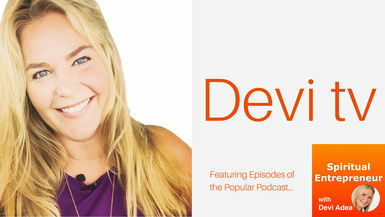 (Septemberfest) In this episode, Devi chats with Eva Vennari about “The Physical Aspect of Spiritual Healing”. Eva is going to be talking today about the physical aspect of spiritual healing. Uh, this September fest is going to be a little bit different than our regular programming and that we're gonna be running this for a couple of weeks in September and you're going to be getting all sorts of amazing topics that will support you on your journey of spiritual entrepreneurship. So even in our, he is the founder and CEO of the elevate institute, a cutting edge health coaching firms specializing in empowering individuals to take charge of their body and their health. She's the creator of reveal a hair analysis technique that lets you understand what is exactly your body, you’re what it is exactly. Your body needs to heal and rejuvenate, evolve academy, the school of purposeful living, and elevate high end retreat experiences to create lasting shifts. She is on a mission to dismantle the status quo of the sickness industry, having spent most of her adult life suffering from all kinds of conditions and fighting her, fighting for her sanity, she decided to take matters into her own hands. That's when everything shifted and our body went from being the enemy to being her best and most devoted ally and partner even now teaches worldwide how sensitive people can take charge of their well-being and thrive in their lives.